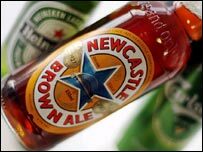 Brewer Scottish & Newcastle (S&N) has found itself the victim of a bar room brawl. Its assailants, Denmark's Carlsberg and Holland's Heineken, last month launched a hostile £7bn joint takeover bid for the second-largest UK beer company. S&N, owner of brands such as Fosters, Newcastle Brown Ale, and John Smiths, immediately rejected the approach, and the insults have flown ever since. Amid levels of acrimony that show you do not need to consume excessive amounts of the firms' products to have a good shouting match, S&N's chief John Dunsmore has accused Carlsberg of trying to break in through the toilet window. Mr Dunsmore has even gone on to say his own mother could have afforded to make a higher bid, so derisory have been Heineken and Carlsberg's two offers - the first at 720 pence per S&N share, and then a higher offer of 750p. Carlsberg and Heineken have countered that S&N's core business in western Europe "remains under pressure", and that the UK group's latest trading update is "unconvincing". But if S&N is struggling on the continent - something it strenuously denies - why are Carlsberg and Heineken so interested? The short answer sounds like something from a spy novel - it's Russia and a very dangerous shotgun. In essence, Carlsberg and Heineken are trying to buy S&N because Carlsberg wants to gain total control of a Russian brewer it co-owns with the UK firm. 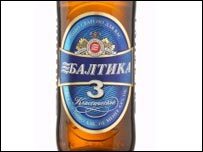 The company in question - Baltic Beverages Holdings (BBH) - owns Baltika, Russia's best-selling beer brand. And in marked contrast to stagnant beer sales in Western Europe and North America, the Russian beer industry is booming. The market grew 23% in 2006 alone, and Russian drinkers now consume an average 67 litres of beer per year compared with just 20 litres in the late 1990s, as increasing numbers switch from vodka. With growth this strong, it is no surprise that BBH is highly profitable for Carlsberg and S&N, which both own an equal 50% stake. But where does the firearm come into it? The term shotgun refers to a clause in the joint venture that makes it deliberately difficult for either Carlsberg or S&N to gain full control of BBH. Like an organised Wild West shoot out, either Carlsberg or S&N can formally offer to buy out the other's share. However, they only get one crack at it. This is because if the other company then immediately comes back with a higher bid, it has to be accepted. With this clause in place, the risk of losing everything is simply too high for either side to make a realistic move. It is for this reason that buying the whole of S&N would be a far safer - if more expensive - move for Carlsberg. Heineken enters the picture as Carlsberg's co-bidder because it has its eyes on S&N's main UK business, with the two firms planning to split the British company between them. While S&N has vowed to see off Carlsberg and Heineken's hostile approach, pledging to cut costs by £20m and launch a legal challenge, financial analysts covering the beer industry are being tight lipped about the firm's chances of survival. Such has been the heat of battle between S&N and its two assailants, that finding an analyst prepared to go on record with their views is harder than discovering a lager drinker who prefers his pint served lightly warmed. Off the record, most say S&N is doomed. "Carlsberg and Heineken will get S&N within the next three or four months," one analyst tells the BBC. "Raising their bid to 780p or 800p per share should be enough. "It's simply because S&N shareholders will realise they will get far less if the firm remains independent." What beer industry analysts are prepared to talk about on the record is that Carlsberg and Heineken's interest in S&N is just the latest example of seemingly ever-growing consolidation in the global brewing industry. This consolidation has been caused by a number of factors, but most pressingly, falling sales in long established Europe and North America markets. In the UK alone, recent figures from the British Beer and Pub Association show that overall beer sales have fallen 22% since their 1979 peak. The drop has been blamed on an increasing preference for wine and sprits, and the situation is the same in the US. Brewers, further hit by higher costs for key raw materials and packaging, and price deflation in the supermarket sector, are joining together to achieve economies of scale. This was the case back in October, when SABMiller, the UK-listed world number two brewer, announced that it was forming a new alliance in North America with Molson Coors. 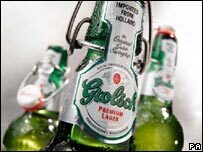 SABMiller also recently announced that it had bought Holland's Grolsch for 816m euros ($1.2bn; £583m). Further, there is also continuing speculation that the world's largest brewer, Belgian-Brazilian group InBev, could join with number three and Budweiser owner, US firm Anheuser-Busch. Against this backdrop, S&N, the world's seventh largest brewer, appears to have a fight on its hands if it wishes to retain its independence.